Days Gone Trailer Showcases the Dangers of the Northwest | Nerd Much? 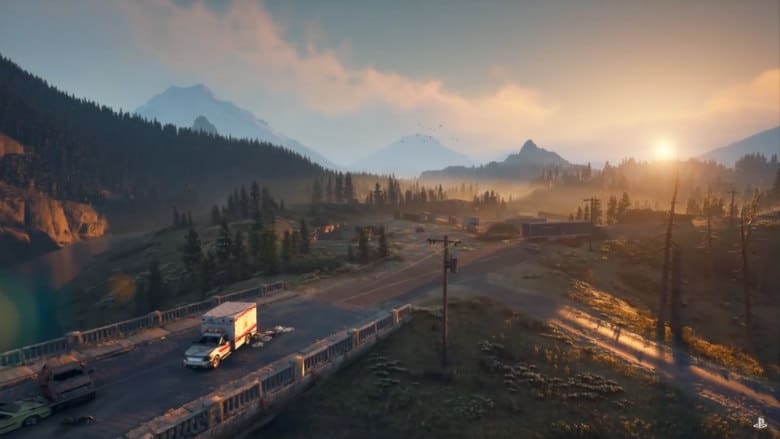 As we lead up to the release of Sony’s next big first-party title in April, the publisher and team at Bend Studio dropped a new Days Gone trailer that depicts the dangers of the game’s Pacific northwest. And as you can see in the footage below, the landscape is both lucious and lethal. Today’s new Days Gone trailer is the first in the “World Series” entitled, “The Farewell Wilderness”. It spends the a majority of its time following Deacon as he traverses the varied envrionments ontop his (very) trusted motorcycle. As on display in the lateest Days Gone trailer, you’ll find yourself riding through abandoned highways, thick forests, steep snow-covered peaks, and more. Along the way you’ll constantly be under threat of wolves, Freakers, Marauders, cougars, and numerous other treats scattered across the post-apocolyptic environment. The Oregan plays host to naturally formed lava tube caves that many Freakers call home. There’s beautifully vistas you’ll encounter that are likely too danger to stop and appreciate. There’s also a high desert location that wears its history of ancient volcanic activity. And there are numerous cabins, towns, saw mills and truck stops riddled with the dead, as the people who fled to them had no idea they were just as dangerous as the cities they were leaving behind. If the scenery from the new Days Gone trailer was enough to cement your purchase, you can preorder the PlayStation 4 exclusive for some additional bonuses. Those that do preorder will earn themselves a bike upgrade that increases your defense against bullets and freaker attacks, as well as upgrade your gas tank for further excursions. Sony will even throw in some sweet, sweet nitrous too. There’s also a Drifter Crossbow that you’ll gain early access to in the game. The developers tease that it hits “harder, faster and farther” than the standard variety. You can check all the goodies out in the trailer below. And go hands on with Days Gone yoruself when it launches on April 26th.